I have just installed Open Bravo ERP (OpenbravoERP_2.40-windows-installer). Here is how I proceeded. OpenBravo requires JDK, Ant, Tomcat, PostgreSQL. You can install these applications before starting OpenBravo installation or during the installation (I downloaded and installed during OpenBravo installation). Download and install Ver. 1.5 or later. Wizard will automatically detect where it is installed. (or locate it, if it ask). Select the installation-dir. when wizard asks for it. (simple “next”, “next” process). Choose and remember password and port number (5432 default) which you configure during installation process. When OpenBravo installation wizard asks for it, locate PostgreSQL base-dir/bindirectory. Input hostname = “localhost”, and port = 5432 (or that you configured earlier during PostgreSQL installation). OpenBravo wizard will run the PostgreSQL automatically. Type your PostgreSQL superuser password. Choose a password for user “tad”. OpenBravo uses it to talk DB. The setup continues … Keep reading wizard status, it tells what’s going on. 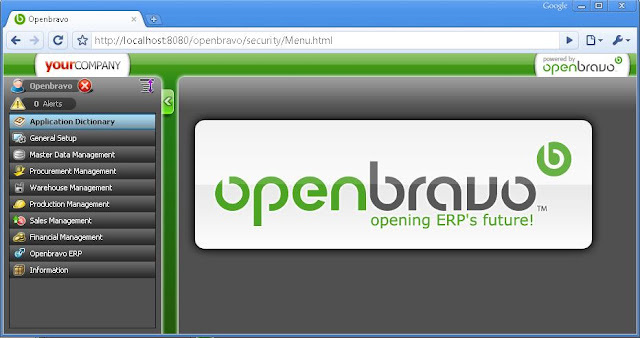 OpenBravo default user is “Openbravo” and Password is "openbravo” to login. I have installed Ver 2.4, i think there should not be much difference in installation of later releases. I have plan to configure its Sales and Warehouse modules for a trading company. I will keep sharing, when did. can i install it in windows 7 32bit? Yes ofcourse you can.. But you will need 4GB Ram or more. I installed postgreSQL 9.2 and when i started installing OpenbravoERP and gave the postgreSQL path as given above..the installer is showing an error asking me to install postgreSQL version 8.1.4 or higher..!! i had faced the same problem. it is available with windows installer msi..